3SG's second in the series of Ambush Point Tiles is Rivers. It's time to get your feet wet! Yeah, there are rivers marked all over your world map but do you ever actually game on them? From swamp islands to river pirates; contested fords to back against the water battles, the water calls forth with the sound of adventure. Don't just stand on the bank. Come on in, the water's fine! Don't be limited by a pre-printed tiles, modify and add your own touch of deception with a Dry or Wet Erase Marker. The versatile modular design allows the use of one, some or all of the Ambush Points Tile set together. Each tile section has a non-skid foam back. Foam backing is also suitable for double sided temporary tape. Attach our tiles to a table, battle map or light coloured cardboard for more permanent structures. 1" x 1" grid blends into the top down view to be functional yet still subdued. 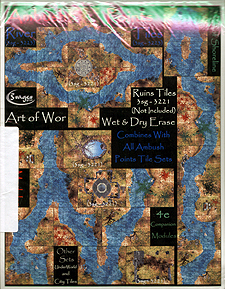 All Art of Wor - Tile Sets are sized so that folding or rolling is not required as they are easily stored with your game books or in binder sleeves.